CAPE CANAVERAL, Fla. ? The private spaceflight company SpaceXis examining a cracked engine nozzle on its commercial Falcon 9 rocket that has?delayed the inaugural launch of the firm's new Dragon space capsule. The company, formally known as Space ExplorationTechnologies, planned to launch the Falcon 9 rocket and its first operational Dragonspace capsule today (Dec. 7). But the company postponed the launch after discoveredtwo cracks in the aft end of the second-stage engine nozzle extension of theFalcon 9 rocket. 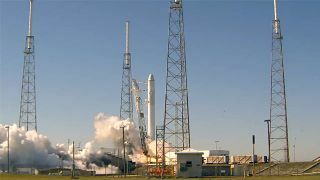 NASA and SpaceX officials have stated that a launch attemptcould occur as early as Wednesday. SpaceX is expected to announce a decisionthis evening. The bell-shaped nozzle extension, which measures 9 feet (2.7meters) tall and 8 feet (2.4 m) in base diameter, is made of an alloy metalwith a melting temperature high enough to boil steel. Yet, despite itsintricacies, this component is geometrically the simplest part of the engine,SpaceX officials said. The Dragonspacecraft and Falcon 9 rocket form the core of SpaceX's plan to provideunmanned cargo deliveries to the International Space Station under a $1.6billion contract with NASA. SpaceX will provide 12 Dragon flights under thatcontract. NASA plans to rely heavily on commercial spacecraft such as SpaceX'sDragon for access to low-Earth orbit once the agency retires its spaceshuttle fleet next year. SpaceXfounder Elon Musk, a millionaire who also co-founded the Internet paymentservice PayPal, has said that while the initial Dragon capsules will serve asunmanned space freighters, SpaceX is also developing a crewed version of thespacecraft to carry up to seven people on round trip flights to orbit. ? For the Dragon capsule's maiden flight, engineers andtechnicians are completing a thorough investigation to ensure that these cracksare not symptomatic of more serious problems. SpaceX initially stated that a new launch attempt would notoccur earlier than Thursday, with additional opportunities on Friday andSaturday if needed.? The company is considering several options, includingrepairing the crack or shipping a replacement part from their headquarters inHawthorne, Calif.
"The most likely path forward is that we will trim offthe thinnest portion of the nozzle extension, which is where the cracks arelocated, perform a thorough systems check and resume launch preparation,"SpaceX officials said in a statement. SpaceX's Falcon 9 rocket set to launch this week is thesecond Falcon 9 booster to fly. The company successfully launched its firstFalcon 9 rocket in June.